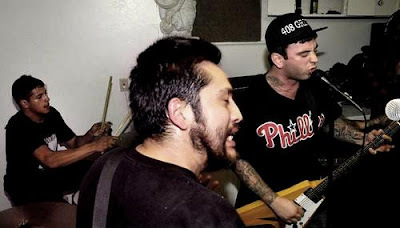 In Disgust is a destructive grindcore outfit based out of San Jose, CA. Formed back in 2006, these dudes play a super-heavy blend of blazing grind that's filled with walls of distortion and blaring intensity. These guys are insanely tight live and create a surely-blissful amount of blasting chaos. Girthy vocals of howling growls and gut-wrenching shrieks are coated over a non-stop orchestra of fuzzed out bass, crunchy riffs and endless amounts of blastbeats. One word….ROWDY! Snag their discography below and look for a split 5" with SFN in the near future. DIG!